Celtic manager Ronny Deila believes his side are now showing the hallmarks of his football philosophy after watching them beat Dundee 2-0 in the Scottish Cup. Goals from Leigh Griffiths and Stefan Johansen sealed a comfortable win as Deila's charges made it six wins in succession in all competitions. "I love winning and developing things and that's what we're doing now," the Norwegian told BBC Scotland. "We're starting to look like a Ronny Deila team and that makes me happy. "I'm very happy with the performance, the team spirit and the energy. We seem very quick and sharp, and I saw that in training last week. We are improving all the time. "If we needed it, we had another level to go to. Today we won in a very good way, Dundee is not an easy team to beat and they have very good confidence now - they hadn't lost for five matches and I can see why. "There is a very good team spirit and we're having a lot of fun, you can see that on the pitch. People are enjoying running, enjoying chasing. Also, now the offensive side is coming more and more, and that's the thing we have to work even more on, to get more tempo in the last third of the pitch." Striker Griffiths is enjoying a run in the starting line up and is determined to add to his tally of his seven goals for the season. "We started at a great tempo and it was good to get the early goal, just as we did last week, and it calmed us down a bit," the 24-year-old said. "I don't think I've scored as many headers in one season but I have to keep it going, I want to continue this form." Dundee manager Paul Hartley was left to rue a below-par display from his outfit. 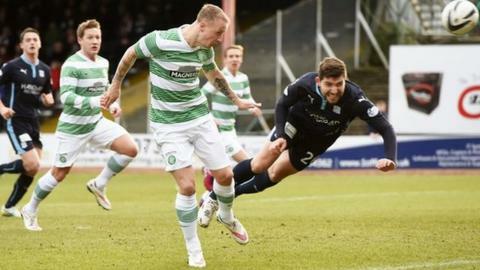 "I'm disappointed in how we played and how we went about our business," he told BBC Scotland. "We worked all week on what we wanted to do but we just didn't perform today. "The first goal is something we've looked at and worked on, but we just switched off a bit. [Mikael] Lustig gets the cross in and Griffiths does what he does in terms of getting across people and getting the finish. "In the second half you want to give yourself a chance by staying in the game and then in the last 20 minutes you can have a right go at them, but it was a poor goal. It was a fantastic save from the goalkeeper but our players just didn't react. "We just weren't at it today, we're not going to dress it up, we were second best all over the park. "Our goalkeeper [Scott Bain] was outstanding, I think he made four or five magnificent saves and he's been doing that for the last few weeks. He's a top young goalkeeper and today he kept the scoreline down."